boeing has introduced a faster but more polluting aircraft, the sonic cruiser, despite warnings given about its harmful effects on the environment by the Intergovernmental Panel on Climate Change ( ipcc ) of the United Nations. The new delta-wing jet, which was unveiled at a show held in Paris in July, 2001, travels at a speed almost similar to that of sound and will reduce flight duration by approximately 20 per cent. This means that travelling time would be shortened by about one hour for every 4,828 kilometres. The jet will be available in the markets between 2006 and 2008. According to the ipcc report , commercial jets account for 3.5 per cent of the greenhouse gas emissions. The report Aviation and the Global Atmosphere states that the supersonic aircraft would be five times more polluting than the subsonic aircraft (those travelling slower than the speed of sound). 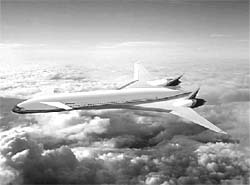 The plane will consume fossil fuel up to 35 times more than other planes in order to attain the enormously high speed. The company admits that the plane would increase carbon emissions, as it would use more fuel, but states that it would help save travellers time. "There is plenty of fossil fuel around," says Boeing's vice chairperson, Harry Stonecipher. "People are worried about the consequences of burning fuel, but if you can offer speed and range, then the sonic cruiser is a clear winner," adds Mulally. This statement has been criticised by environmentalists and the industry alike. Noel Forgeard, chief executive of Airbus, says, "I am surprised. More fuel consumption means more pollution."